This year my math students have been creating and publishing math content. Most of the creation has taken place on iPads through different presentation apps. While finishing up our math comic strips I came across the app Flowboard. At the time of this writing Flowboard is a free presentation app that gives users 200mb of space. My first thought was that students could potentially create a project and use Flowboard as the medium. After experimenting a bit with the platform, I concluded that the class could create a presentation that would include different templates, images, text, videos and links. I found that the links can be part of the presentation or send the viewer to an external site. This is huge because students could potentially create a table of contents and the viewer could view parts of the site that they prefer. 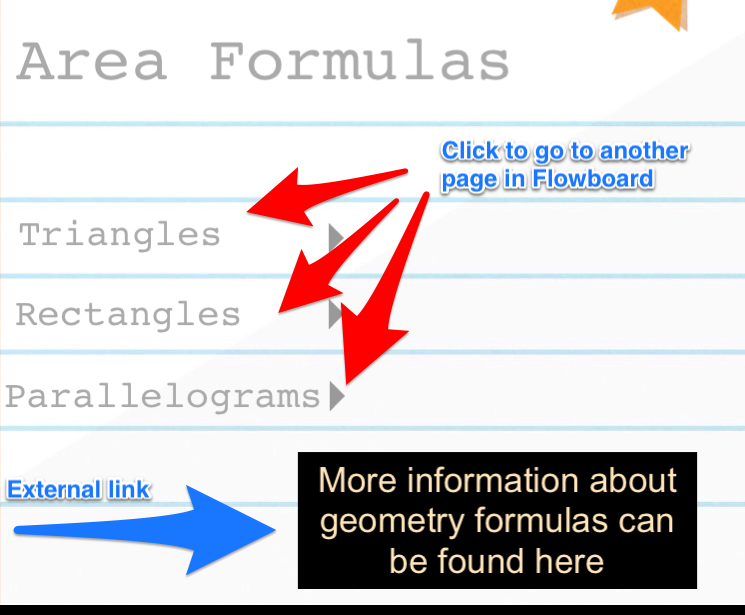 Or possibly, students could add links to a different Flowboard or external site for more information about a particular topic. As I introduced the app, students were given time to get accustomed to the features and create a brief sample. I used one classroom account for this project and students all entered the account at once. After everyone had a chance to play and create something, the class looked over the mastery objectives for the next unit. From the list, students were given an opportunity to pick one objective that would eventually tie into their Flowboard presentation. After all the objectives were chosen, students helped create the rubric. I gave a baseline and then asked students to add to the rubric. Some of the suggestions were stellar, others not so much. The class decided to make a minimum requirement for many of the different criteria. The class eventually came to a consensus and the rubric was set and available for students. The process of picking topics and creating the rubric took about 40 minutes. Looking back, this was time well spent as the expectations seemed to be clear from the beginning. From there, students were given time to research. Textbooks, iPads, manipulatives, and computers were all used during this research time period. I felt like my role was to help guide students towards resources that might be helpful. Throughout this process and other content creation opportunities, I’m finding that students are taking more initiative in seeking out the resources that are needed. This independent thinking is encouraged in elementary classrooms. For an elementary classroom this is a big #eduwin. Students filled out a graphic organizer to compile their thoughts on what the presentation would look like. Students were then given three 30 minute sessions over the next few weeks to create and publish their presentation. During that time I set up check in times to see the progress of the presentations and ask questions. I soon found out that my students needed more than the 200mb of space to fit all their projects in one account. I called up the company and was able to get extra space for my classroom. Students finished the projects and uploaded their link to the app Showbie. From Showbie I’m able to add the links directly to the student eportfolio sites. After students finish they are scheduled to present their presentation to the class. I also embed the presentation online for parents of the community to see. This is a brief sample that I created to show students. The student projects are MUCH better since they all picked different templates, added their own pictures/videos, and added links to complete their presentations. Getting the students involved in creating the criteria for success is lovely. Too often we give them the criteria without seeking their input. You are not only creating ownership the students are less likely to omit one or more criteria. On a side note, have you checked out Tellagami? This post contains links to some interesting stuff. Hi Mary – The students were excited to be part of the rubric creation process. They took ownership and added items that helped the overall project. I was impressed with the new criteria and how the students took on the additional responsibility. I downloaded Tellagami onto the school iPad set earlier this year. I’ve used it a few times, but more for explaining concepts to students. I need to take a closer look at how it could be used with the students. Thanks for posting the link. I appreciate how the site clearly explains the SAMR model. Reblogged this on Inside the classroom, outside the box!.